This is a very typical BCA slate poster for a June or November election in the 1970s and 1980s. In this case it is June 1980. Congressman Dellums, Assemblyman Bates, and Alameda County Supervisor George were all extremely popular progressive Democrats. Their re-election was certain. The three Democrats are slated with Measure D, the Berkeley rent control ordinance. The poster and the campaign are really about Measure D, whose fate is unknown. Votes by association was the strategy. 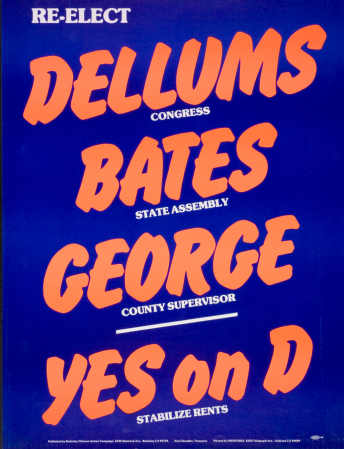 If enough ordinary liberal Democrats accepted voting for Measure D as comparable to supporting Dellums, Bates, and George, Measure D would win. It did win, on June 3, 1980.